Global Campaign (c, 3, Curlin–Globe Trot, by A.P. 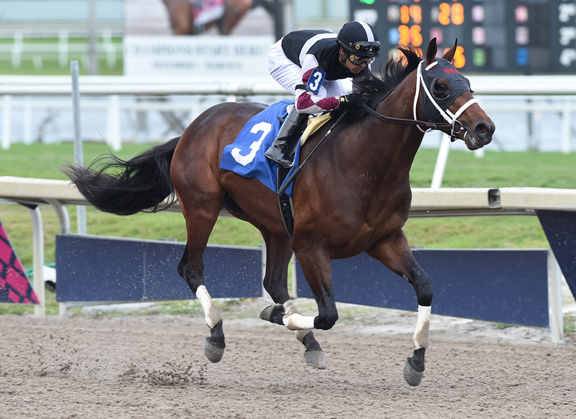 Indy), a razor sharp debut winner with an 85 Beyer Speed Figure going seven furlongs at Gulfstream Jan. 5, successfully stretched to two turns in a salty optional claimer in Hallandale Saturday, good for ‘TDN Rising Star’ honors. The half-brother to the talented Bolt d’Oro (Medaglia d’Oro), MGISW, $1,016,00, fired a five-furlong bullet in 1:00 2/5 (1/9) at Palm Meadows Feb. 3 and was off as the 3-5 favorite here. He broke sharply and showed the way into the clubhouse turn, but backed off to chase in second as Blue Steel (Will Take Charge) made an aggressive move entering the backstretch. Global Campaign charged up on the outside to draw alongside Blue Steel through a half-mile in :47.57, took command without being asked on the far turn, turned for home in complete control as Luis Saez took a peek under his shoulder, and was geared down late to cross the line 2 1/4 lengths clear over the comebacking GISP Standard Deviation (Curlin). Blue Steel tired to fifth. The final time for 1 1/16 miles was 1:44.29. The $250,000 KEESEP yearling purchase, campaigned in partnership by Sagamore Farm and breeder WinStar Farm, is also a half-brother to Sonic Mule (Distorted Humor), MSW & MGSP, $264,190. Global Campaign is the late Globe Trot’s final produce. 10th-Gulfstream, $44,180, Alw (NW1X)/Opt. Clm ($75,000), 2-9, 3yo, 1 1/16m, 1:44.29, ft. Lifetime Record: 2-2-0-0, $52,200. 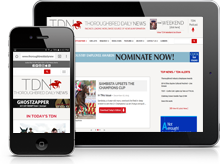 Click for the Equibase.com chart, free Equineline.com catalogue-style pedigree or VIDEO, sponsored by Fasig-Tipton. O-Sagamore Farm, LLC & WinStar Farm, LLC; B-WinStar Farm, LLC (KY); T-Stanley M. Hough. *$250,000 Ylg ’17 KEESEP.